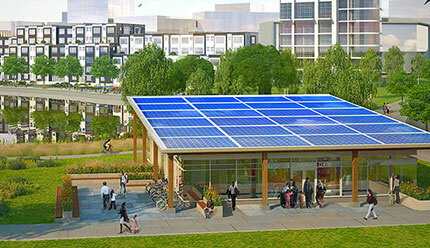 Blatchford will be a community that will be home to 30,000 Edmontonians living, working and learning in a sustainable community that uses 100% renewable energy, is carbon neutral, significantly reduces its ecological footprint, and empowers residents to pursue a range of sustainable lifestyle choices. Blatchford will look to multiple technologies to achieve its high environmental sustainability goals. One of the technologies being proposed is adistrict energy sharing system (DESS). A DESS is similar to a traditional district energy system in that energy from a centralized source is distributed to multiple buildings. While traditional systems deliver high temperature water that can be used directly for heating buildings, a DESS distributes ambient (room temperature) water. The ambient heat is then upgraded by heat pumps, which provide both heating and cooling. One of the main advantages of a DESS is that it allows for greater flexibility to directly tie-in renewable energy sources. Many renewables, such as geo-exchange and sewer heat recovery, provide low-temperature energy which can be used directly by the DESS. Implementing a DESS will also allow Blatchford to share energy between buildings. In a neighbourhood the size of Blatchford, with a large diversity of building types and occupancies, energy sharing can reduce overall energy consumption by 15 to 20%. The more energy sharing that occurs, the less external energy is needed. Learn more about Blatchford at BlatchfordEdmonton.ca.